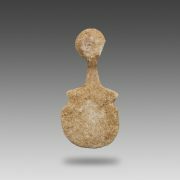 Although conveying a certain charm, typical of traditional folk art rather than formal representations, this statuette shows highly stylized and naive shapes which do not totally lighten the strength of the rectangular block of stone. Datation : 1st millenium B.C., 2nd millenium B.C. Category: Sculpture. 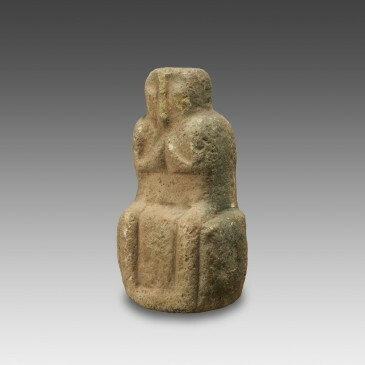 Tag: Seated Statuette. 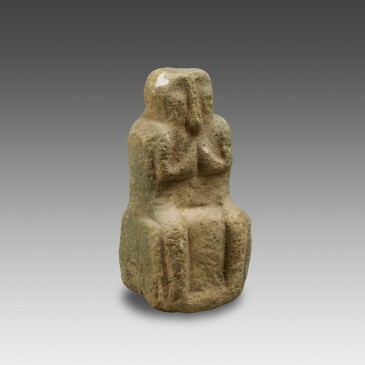 The figure, whose gender is not clearly defined (the absence of breasts and the low-detailed shapes would rather suggest a male body), is seated on a cubic stool without any carved details. The torso of the figure is straight, the back is smooth and without details; the legs are simple rods in light relief. The arms of the figure are folded and the triangular hands are brought back to the chest. The head is a cube with rounded angles, without any headgear but with a slight depression on the skull. Only the face shows anatomical features – although in a very simple way -, such as the slightly hollowed eyes, the high cheekbones and the thin, vertical nose that somewhat recalls a long beak. Typologically, this figure belongs to the series of Near Eastern images representing a faithful worshiper, which were generally offered in sanctuaries and served as perpetual dedications to the deity. During the second half of the 2nd millennium B.C., the tradition of carving seated statues is well established in the Syro-Anatolian world, with examples as famous as the image of the king Idrimi Alalakh (15th century B.C. 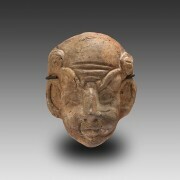 ), the more plastic and elaborate figure of the god El, at Ugarit, or the possibly later series of the basalt statuettes of Tell Halaf. The style and typology enable us to classify our figure in this category of images. 1st millenium B.C., 2nd millenium B.C. Complete and in good condition, aside from a minor wear on the surface; chips. Minor breaks on the underside that do not provide the vessel with good balance. This figurine is flat and slightly rounded. No element enables us to distinguish between the front and the back, or to determine the gender of the figure. This male head is cut straight under the neck. It is hollow and would have been molded in a bivalve mold. 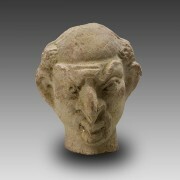 The face shows the exaggerated and archetypal features of the Greek-Roman images known as “grotesque”.